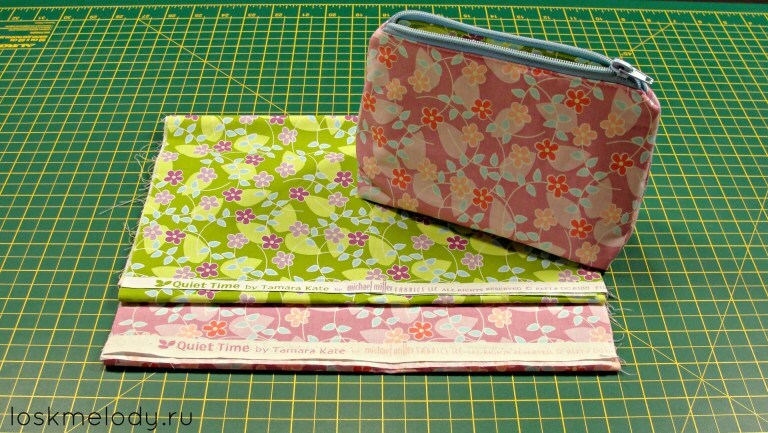 For my Makeup Bag, I chose Michael Miller's cotton fabric — designer Tamara Kate, a collection of Quiet time. This is a very nice collection! I was bribed by bright, rich colors and carefree, "girlish" mood. Make-up Bag turned out fun and colorful. As a cushioning material, I chose the volume of interfacing Freudenberg H640. 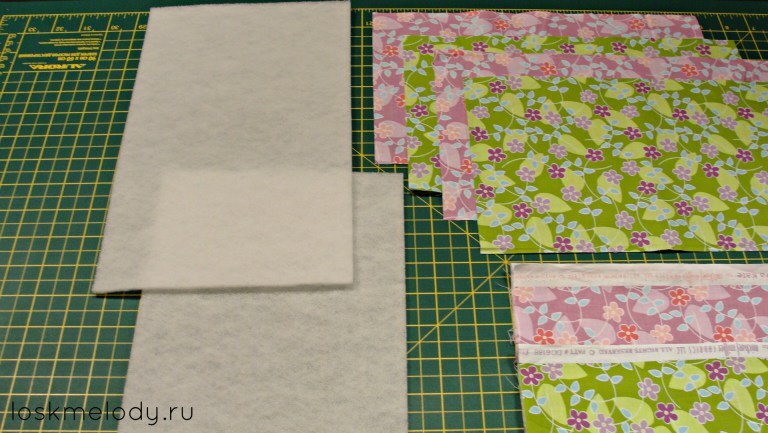 This is a very interesting cushioning material, which differs from the usual glue interfacing in its pomp. 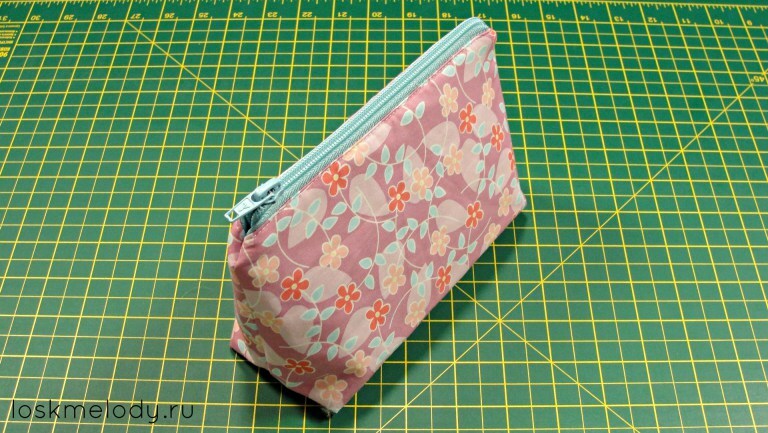 It will give the cosmetic bag shape, density and make it soft to the touch. 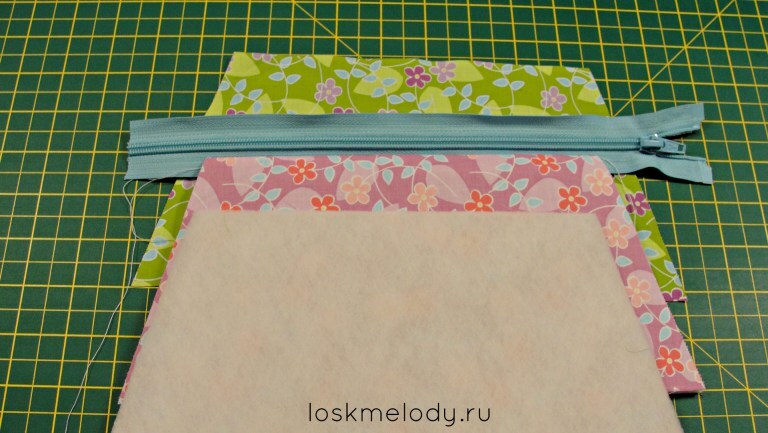 2 rectangles of fabric 30x18 cm for the outer side of the cosmetic bag. 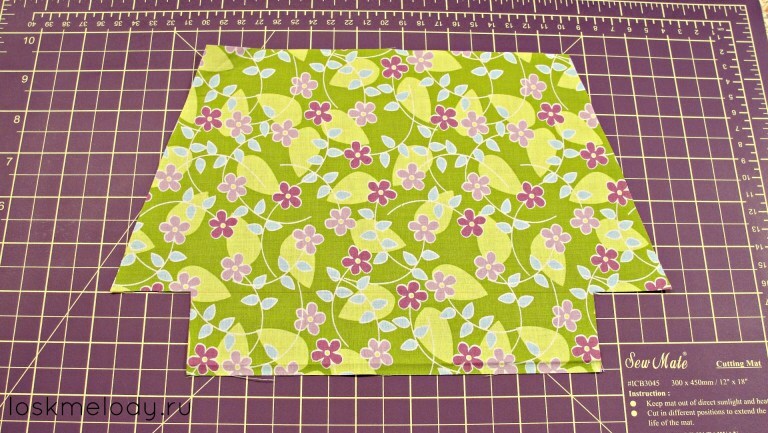 And 2 of the same size rectangle for the lining. 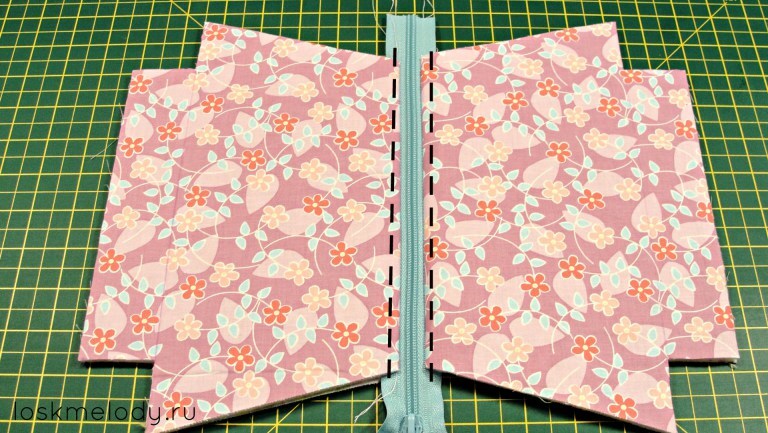 The zipper is at least 25 cm long. 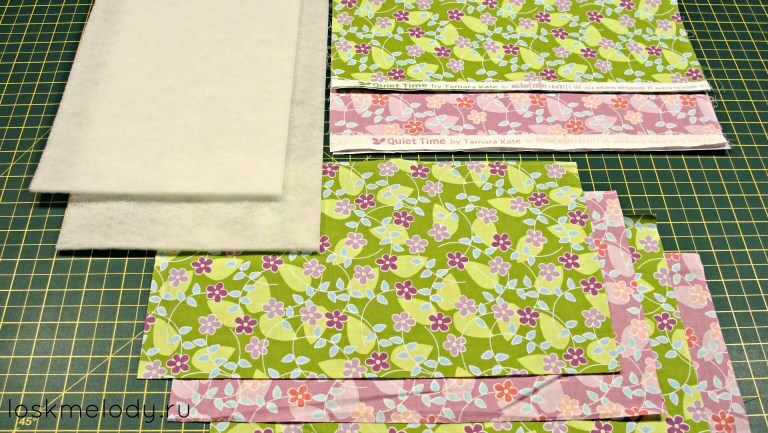 To begin, glue interfacing two rectangles of fabric for the outside of the cosmetic bag. 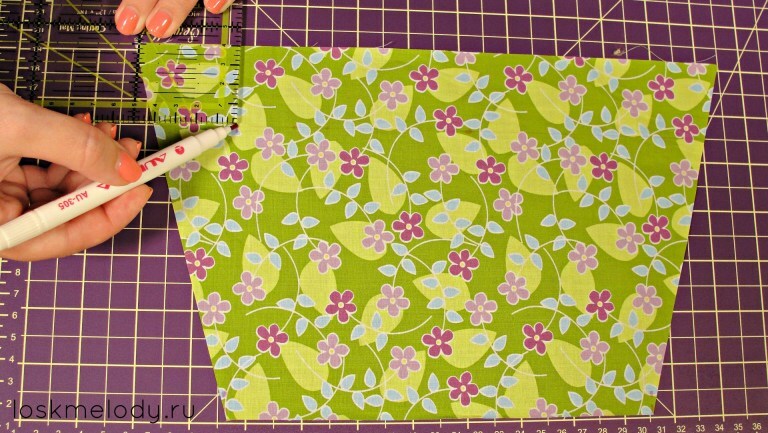 Let's give the cosmetic bag the shape of a trapezoid. This does not need a pattern! 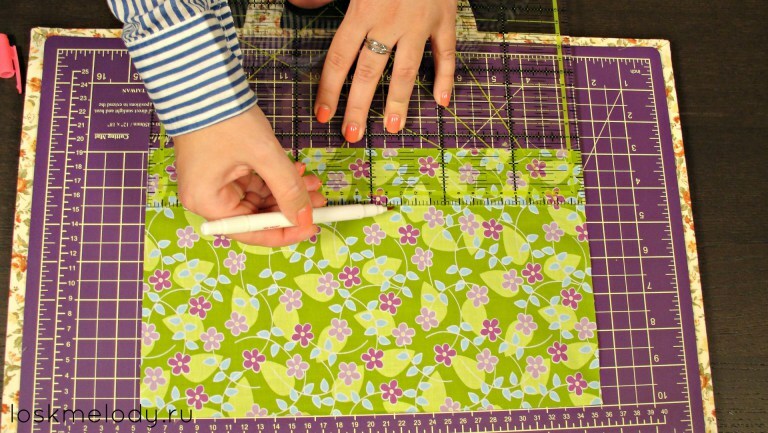 We do it ourselves and not on paper, but immediately on the fabric. 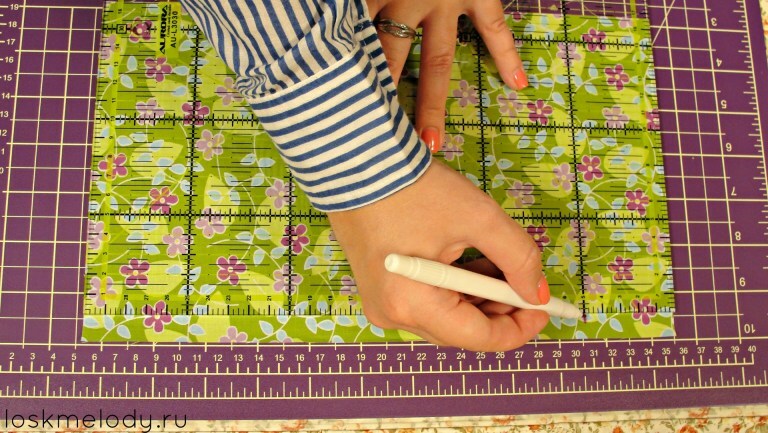 You will need a ruler and marker on the fabric. 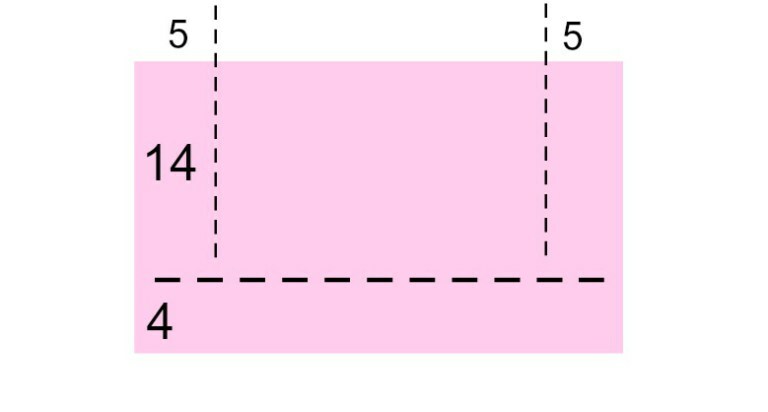 Let's measure 4 cm from one of the long sides of the rectangle - see the photo. 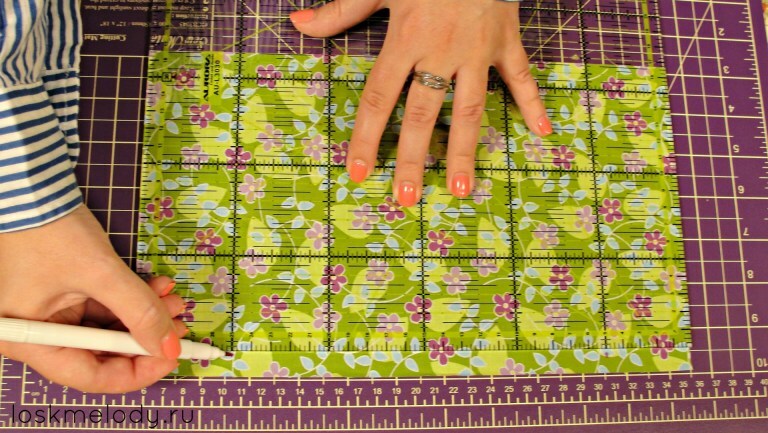 And draw a line with the disappearing marker on the fabric. 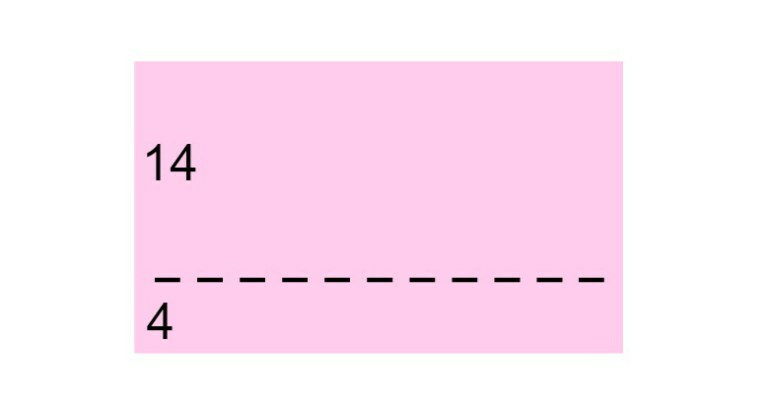 A rectangle of 18 cm in height is divided into two parts - one 4 cm and the other 14 cm. Cut the corners from the top point of 5 cm to the bottom corner - you will get a trapezoid. We cut along the red dotted line. 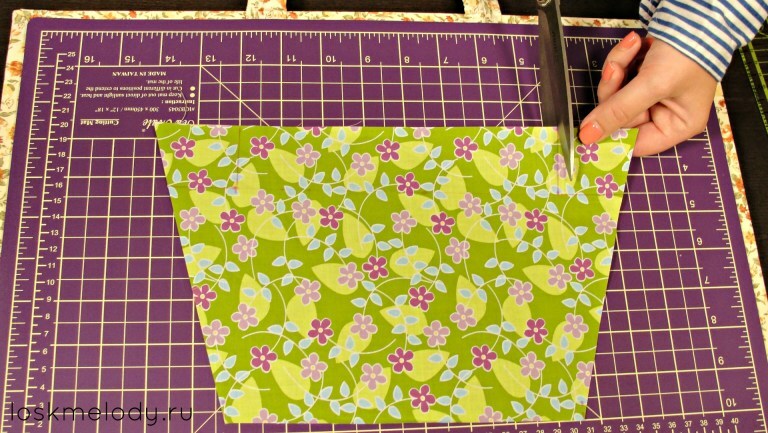 To form the bottom of the cosmetic bag, cut out the corners at the bottom of our trapezoid. Remember that very first line that we drew with a marker on the fabric? Let us measure on it 4 cm right and left. From these points draw a line down. Cut out the corners of the marked lines. All this needs to be done with all the pieces of fabric. Take a piece of cloth for the outside we put it facing us like this (see photo). From above we put the zipper - face down. 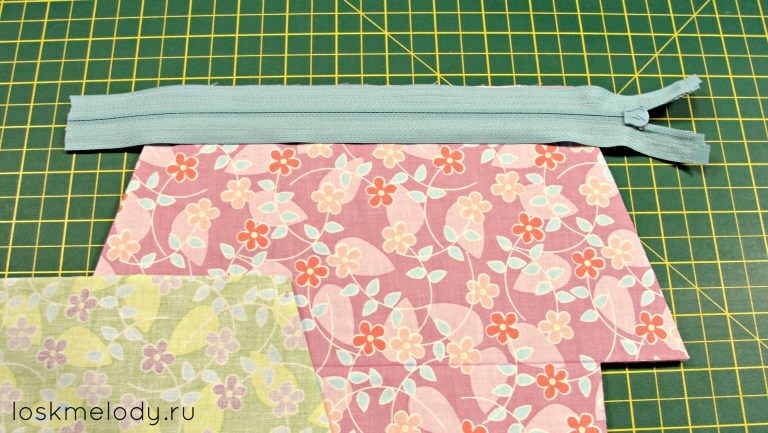 And on the top - fabric for lining face down. 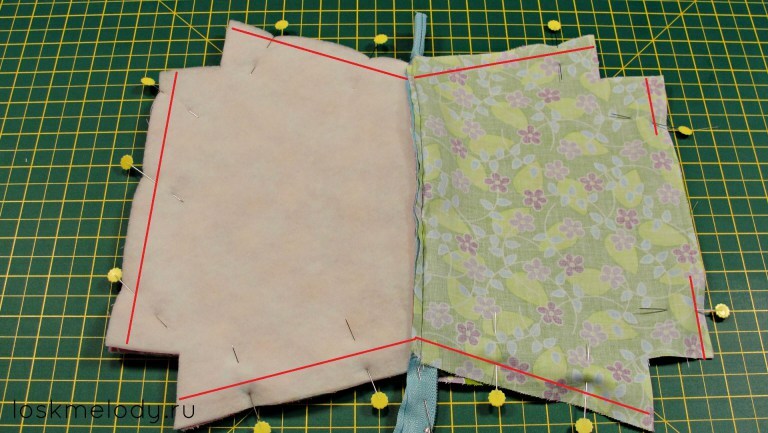 Align all edges carefully and fasten all layers with pins. 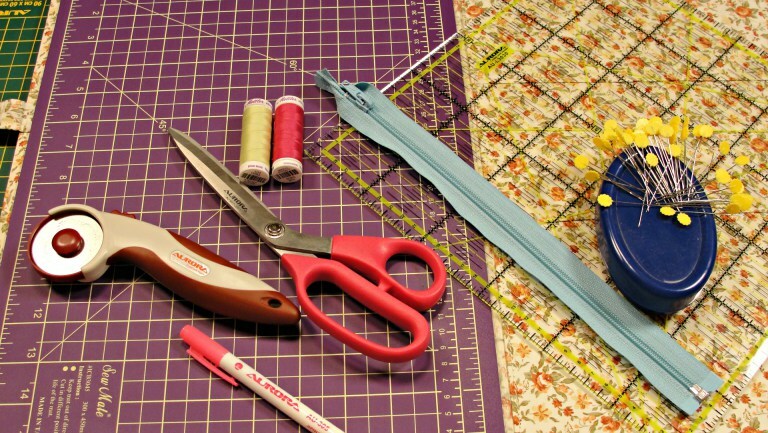 It will be necessary to sew all these 3 layers. 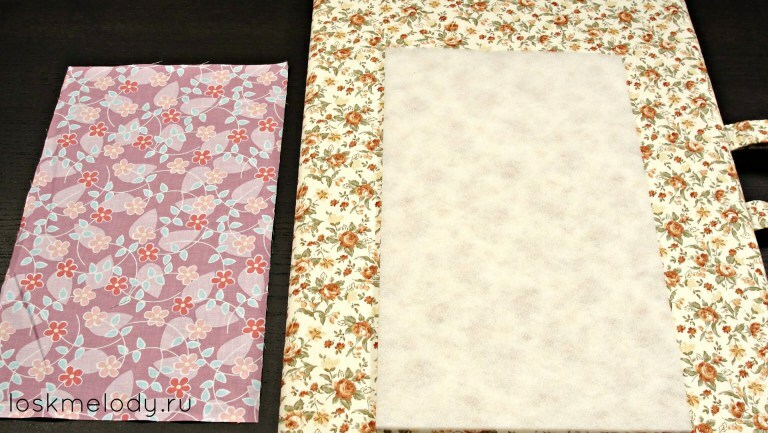 It remains to sew another 2 pieces of fabric. 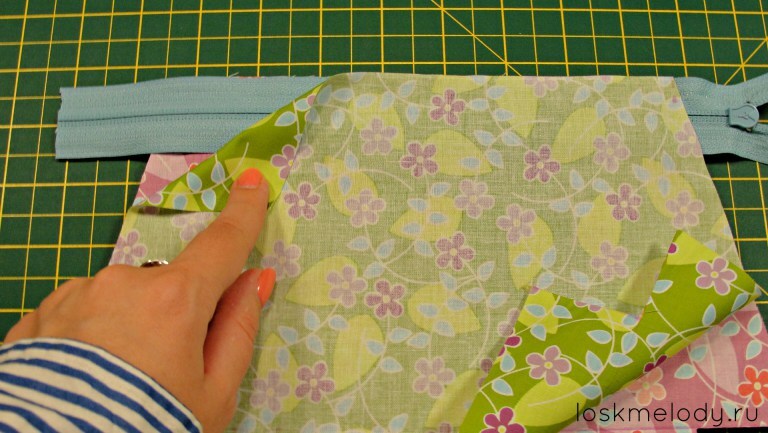 Take what we sewed together and fold it so that the wrong sides of the fabric touch. 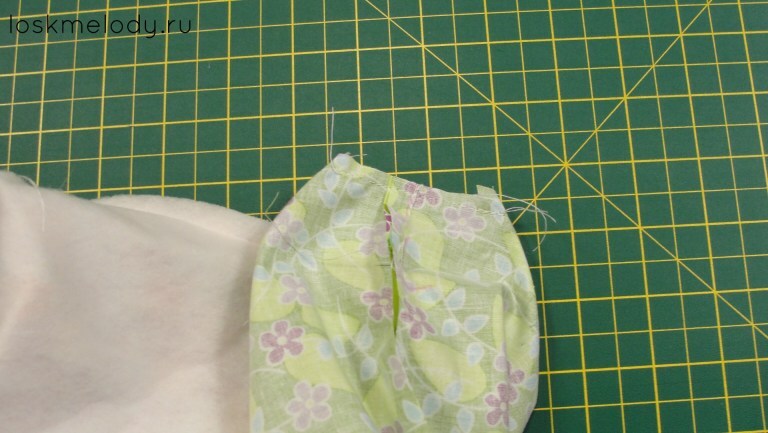 We put the not sewn lining face up, we will lay the sewn part with the outside towards us, the lightning slider looks at us. 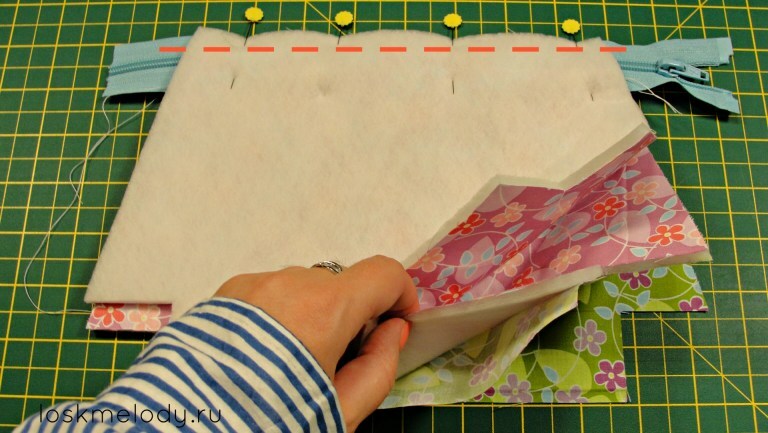 Align the top edge and side edges. Take the remaining outer part, put it face down. 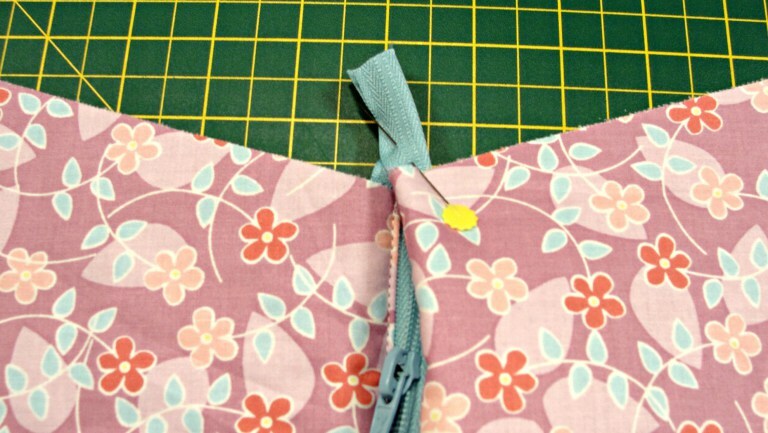 Align all 3 edges: the lining, zipper and the outer part, cleaving them with pins and stitching along the upper edge. 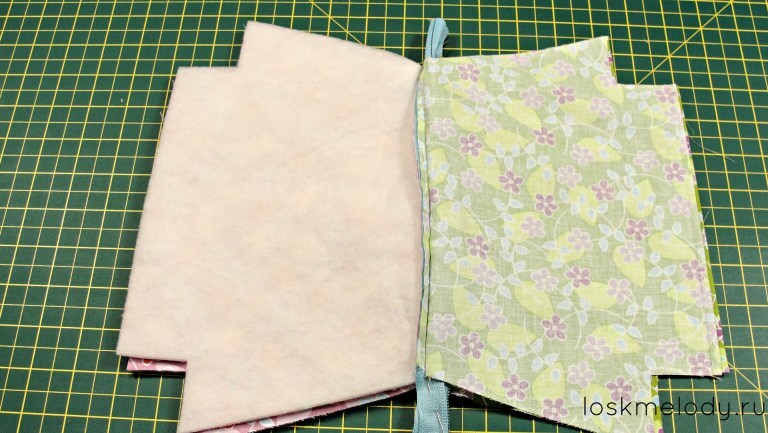 Now we will need to make 2 finishing stitches so that the fabric lies flat and does not fall into the zipper when we open and close the cosmetic bag. 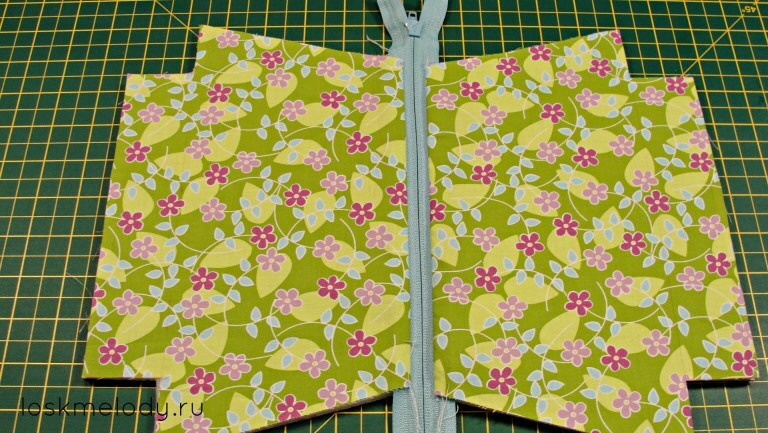 Fold the future cosmetic bag so that it resembles a butterfly - the layers of fabric are divided into two - the lining + face, and their wrong sides are in contact.We sew along the edge of the fabric close to the zipper one seam and the second. So our fabric will never fall into the zipper. 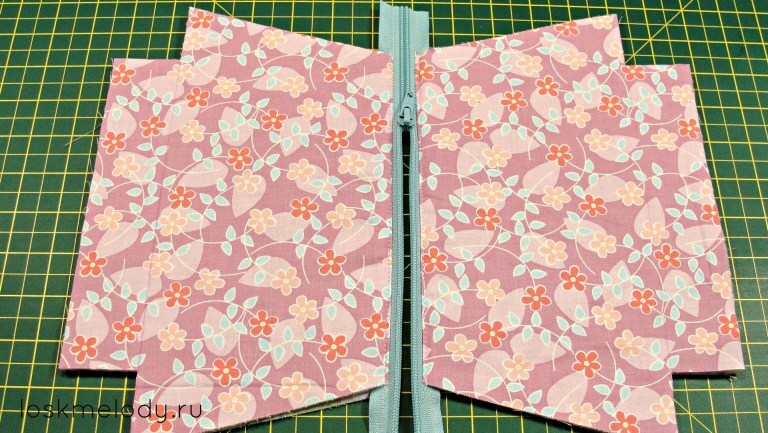 Now we will surely open our zipper a little more than half so that later we can turn out the cosmetic bag. 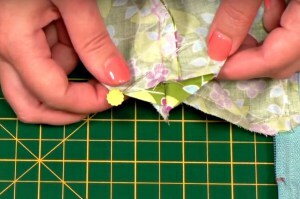 Fasten the zippers of teeth with pins so that they look inside. Take the faces of a cosmetic bag and put them face to face. 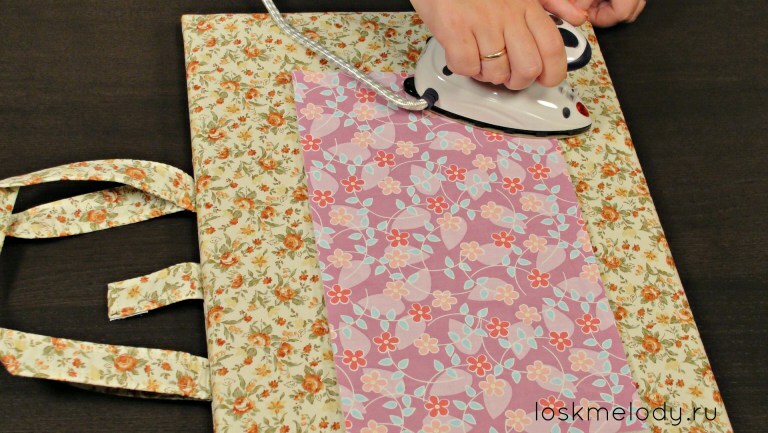 Do the same with the lining. 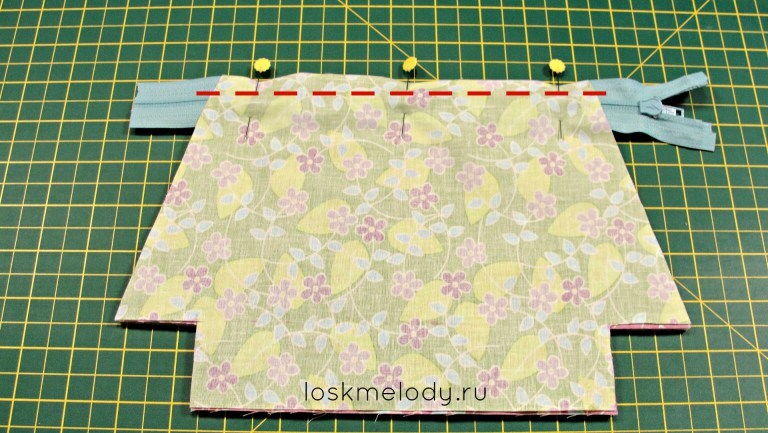 Now we need to align the edges, make sure that the zippers are facing the lining and fasten the pouch with pins around the perimeter. Punch around the perimeter. But we will not leave the corners and the hole in the lining, through which we will turn out the cosmetic bag. 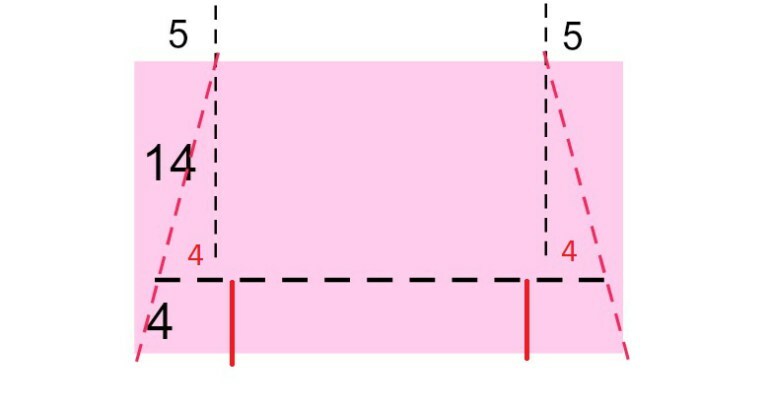 Allowances for stitches about 1 cm. 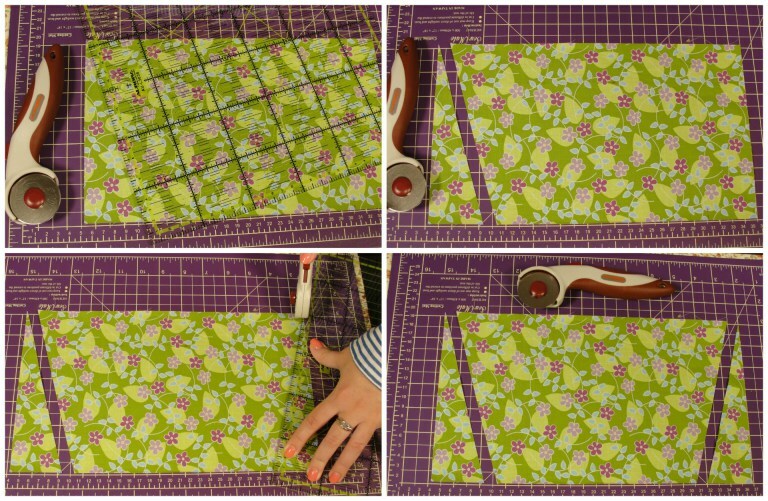 We cut off the extra parts of the zipper and the extra fabric on all four corners. 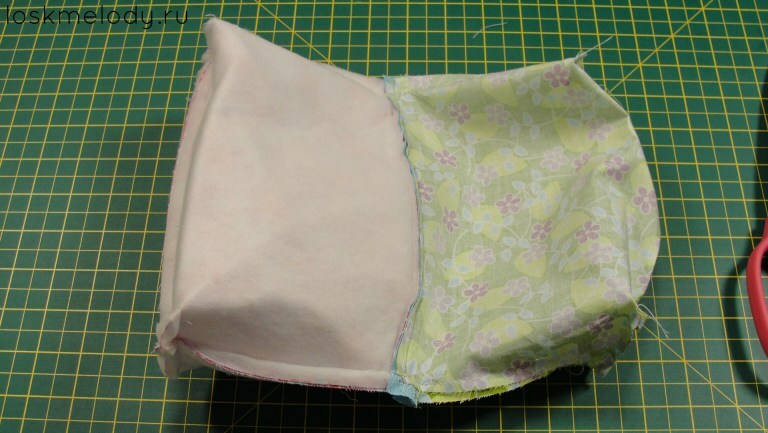 We turn out our cosmetic bag through the hole that we left not stitched. 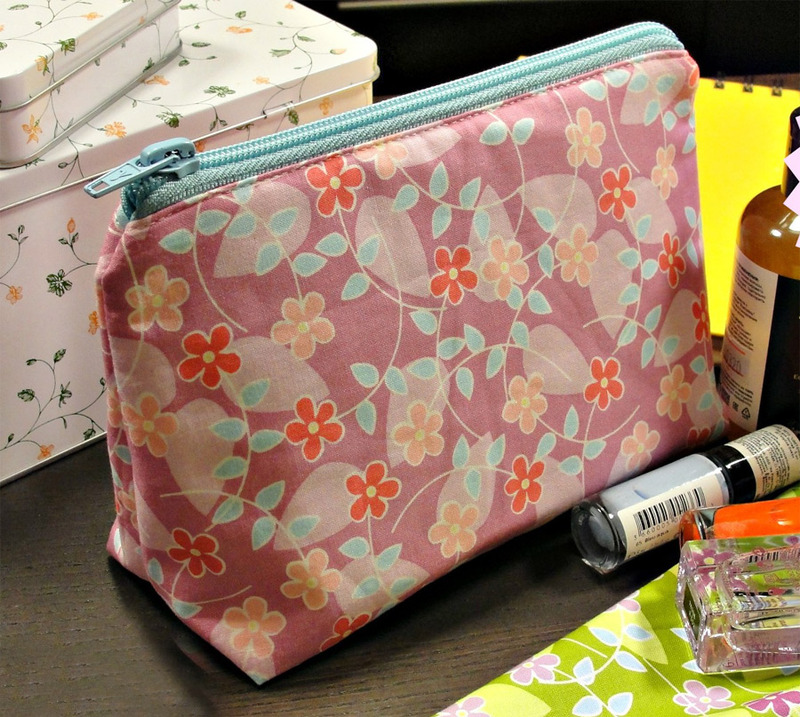 After this, you only need to sew up this hole, and the cosmetic bag is ready! Amei! Grata por tudo! Sucesso! Felicidades! Nice tutorial! 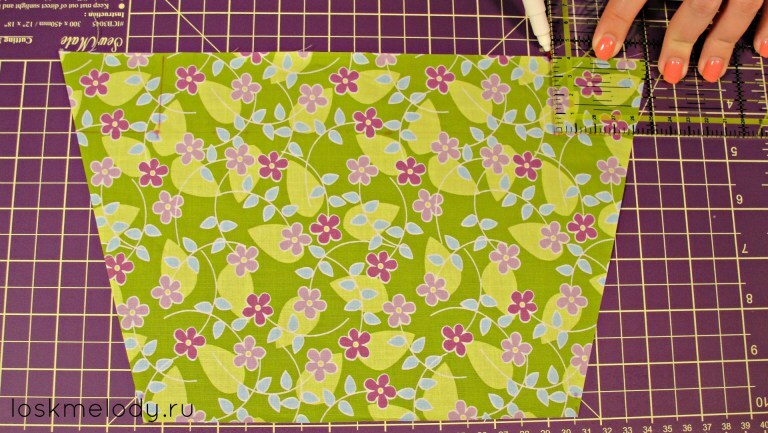 I love this bag pattern. Thanks for sharing!